A new officer has joined the Selma police force. Tuesday night, Officer Stephen “Will” Carter was introduced to the Selma Town Council by Police Chief R.A. Cooper. Officer Carter graduated from Basic Law Enforcement Training at Wake Community College in June. Originally from Indiana he now lives in Garner. He has one daughter and is expecting the birth of a son very soon. He is also enrolled at NC State University as a rising senior. A former marine sergeant he spent three tours overseas. 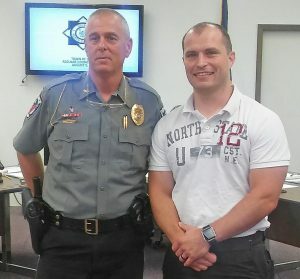 “He will be a great asset to our department,” Chief Cooper told town officials.